Although setting tile can be fun, we sometimes get frustrated trying to space ’em just right. Experienced setters can rely on a practiced eye or thousands of those little spacers. For the rest of us, Prazi manufactures the Set & Go. 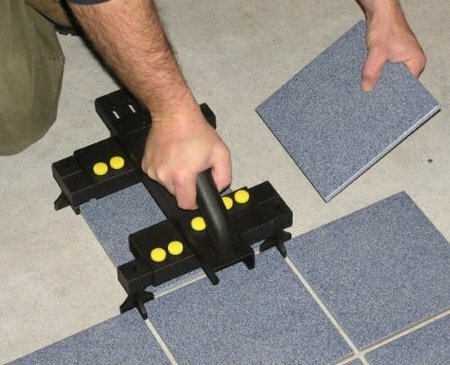 You can adjust the Set & Go to work with tiles measuring 8″ to 16″. The Set & Go holds four spacers in precise position, so you just set tiles on all four sides of it, then move the Set & Go to the next row, and continue setting tiles — no small spacers to set and pick up. You can make different patterns with four different types of spacers: X-spacers for doing grid patterns, T-spacers for staggered or subway layouts, I-spacers for octagonal tiles, and L-spacers for starting in corners. Prazi makes spacers for either 1/4″ or 1/8″ spacing — they include the 1/4″ versions of the X, L, T, and I spacers with the Set & Go. Pick up the Set & Go for $31 at Amazon. They also sell a set of four 1/8″ spacers for about $6. Thats quite the interesting thing. I wonder how well it works though. I wouldn’t imagine it would work on walls at all though. Looks all nice in neat without any thinset all over the spacers. Looks to me like you would upset the already placed tiles when you set the one your working with. Prazi also makes those chain-saw attachments for a Skil 77. Not quite a chain mortiser – but I might buy one if I did timber-framing. I have not consulted with him, but I can’t imagine my tile guy adding one of these to his kit. Maybe OK for a homeowner who is doing only 1 job and can toss it after it gets gummed up. Like fishing lures (some catch more fisherman than fish) – the same is true about tools. Fred: Why would this get gummed up? I’m assuming that you are either laying the tiles in mastic or thinset epoxy – that tends to ooze out as you set the tlies. The ooze out might be even more if you have to back-butter the tiles. I’m thinking that this will get on the plastic parts – and which may not be compatible with solvent cleaning. all of this is speculation on my part – we really should ask folks out there who have actually used one. Looks to me like the only thing that would get gummed up in that case is the spacer pieces themselves, which the post says can be replaced for $6. The way I figure it, $6 per tile job seems about right. Isn’t that about what a bag of plastic spacers costs at a big-box hardware store anyway? I’ve never done any tile work myself, but there may be a tile job in my near future. Ken, I don’t know for certain, but I would think you’d have all those spots with thin cover of grout over them, possibility of it chipping out easily over time (?). Perhaps not as much an issue with a thick tile. My first tile job was probably more than I should’ve taken on. 800 square ft of 12″ ceramic tile using 1/8″ spacers. I left every single one of those things in place and grouted over them. It’s been 5 years and I haven’t seen any problems yet. This is an interesting idea but I’d think the plastic spacer portion would need to be wiped after setting every tile. Seems more trouble than it saves. I’ve had good experience with tile spacers that sit above the tiles — essentially a disk with the cross that sticks down. Much easier to retrieve than the little rubbery ones, and you don’t have to worry about them getting stuck in there and too high to grout over well. They’re a little pricier than the standard ones, but more re-usable. This would be all well and good if everytime you’re laying tile some jackass doesn’t come in and walk right onto it. The spacers are your best bet and I always just stand them up with only one arm between tiles so the floor looks like a giant miniature graveyard (big hassle pulling them out of the 4 corner joint) and run a broom across them before I grout. Please send me all the info, regarding your tiles setting machine with spacers. Also your best price per unit. I set tile often and this device will only work for one pattern. I frequesntly set tile in a overlap or subway pattern. The disc spacers get stuck in the thinset and break, leaving pieces in between the tile. I always go back to the rubber spacers but never set them flat, you will never get them out. Also…..no two tiles and the same size, this is fruestrating but common so precision setting is sometimes tough to acheive and youhave to make corrections by shifting a tile and therefore not using a spacer. I often use folded pieces of cardboard from the tile boxes, always works.